I think that this distinction could be important. The Y-DNA results make a lot of sense. Interesting to see C1a in the TRB culture. Yes and it begs the question why did the C1a become virtually non existent in modern European populations? Well it was likely a minor lineage among Neolithic peoples in Europe to begin with since we know that they were dominated by G2a. The influx of Yamnaya and other steppe peoples definitely had a part in wiping it out no doubt. Northern Europe is an interesting case. 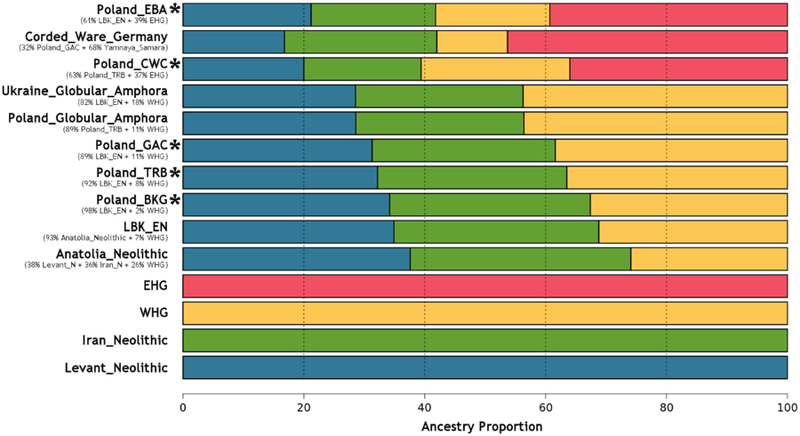 Most of the Neolithic genomes from LBK and related cultures are at very low frequency across Europe, the hunter-gatherer lines that were absorbed by them, seem to be even less. This C-V20 might have been a hunter-gatherer living amongst or near the TRB people. Take for instance the R-V88 in Blatterhohle, or Iron Gates, practically non-existent in Europe except amongst Jewish diaspora, and the odd case here or there. Of course the latter arrived in Europe from the Middle East and is not directly descended from the Iron Gates men. C-V20 has a very low frequency in Europe today as well. I think the point is, most Y lineages in northern Europe are late Neolithic/early Bronze descended. Yes but descendants of I have survived for a very long time and still have a strong presence in Europe. So did the Neolithic E and G2 to a lower extent but surely more common than C which has consistently popped up from Paleolithic to Bronze age. I think it was even found in Lepenski Vir and Vinča. And now there isn't even one pocket in Europe where that hg is found at least in low to moderate frequency. I guess it was just very unlucky for some reason but I'm curious what that reason is. Last edited by oz; 10-11-2018 at 06:11 AM. The same seems to be true for many minor lineages. As ADW mentions, R1b-V88, but also the smorgasbord of dead-end R1b's as well. H2 would be another one. Then when run into the opposite with I1 and E-V13, which sort of exploded out of nowhere. Here is Y dna assignments posted by Semargl on Molgen. EHG is the distinguishing feature for CWC/EBA. I would have expected more EHG and less WHG in Poland_CWC. Guess they were fairly mixed with Globular Amphora-like cultures already. Also, the Levant_N to Iran_N is almost 1:1. Isn't it like 5:1 and more in favour of Levant_N in those parts of Europe nowadays? Where did that Iran_N-derived chunk go? Last edited by Dorkymon; 10-11-2018 at 07:14 AM. All good points. Although this idea of "elites" reproducing more than the lower classes is nonsense. The elites in any society ever were always the minority of the population hence the term "commoner" for the non elites it's self explanatory. And second I would imagine back in those primitive times there wasn't much of a class system, society had to have been more simple. I think the ones who could reproduce more were the ones who had the greatest abundance of food first and foremost. Then other factors like stronger tribal unity, protection from hostile invaders, disease or wild animals and mobility. I wonder how many people died back then from various animal attacks? Their bodies would be completely devoured no bones would remain. Maybe that's why I1 is absent from ancient Dna because the predators found their meat to be the most delicious? Hah dumb joke. Anyway there is no one simple answer obviously. Expansions of Y-dna can have more than one cause, but the most common is because an ethnolinguistic group has gained more land. I1 diversifies with the Nordic Bronze Age, so a tribe with I1 migrated to Scandinavia and for some reason gained land, the tribe separated into many clans spreading everywhere. Proto-Germanics were a tribe that included I1, I2a2-L801, R1b-U106 and some subclade of R1a. E-V13 is a similar case, it was a lineage among others in the first paleo-Balkan tribes, G-L13 has a similar age and distribution. I can think of haplogroup D in Japan as an example of a lineage expanding due to higher social status, Emperors of Japan and many Daimyos were D.
Maybe E-M81 is the most extreme case of elite expansion (if it was) it must have been Masinissa, king of Numidia c.238 BC – 148 BC. He ruled Numidia for some 54 years until dying at about the age of 90. He was vigorous, leading troops until his death and fathering some 44 sons, and a staunch ally of Rome. is there an example of an exclusively upper-class lineage not gaining numbers? I don't know. some claimed I2c2 in the Caucasus is connected somehow to nobility, due to comparatively many noble families belonging to this group, its frequency is 1-5%.